Passengers are welcome to board our ship at 6:00 p.m. After comfortably settling into your cabins, we'll introduce our crew at a welcome cocktail before dinner. Join us on an excursion for both packages: we'll board a local boat for a cruise on the Erdre River, one of the most beautiful in France. CLASSIC : Guided tour of Nantes and the Castle of the Dukes of Brittany. CLASSIC : Guided tour of Angers, its historic districts and the famous Apocalypse tapestry. Enjoy one last buffet breakfast before disembarking at 10:00 a.m. End of our services. The cruise schedule may vary according to tides and arrival times at ports of call may be subject to change. For the safety of our passengers, the captain and crew of the boat may decide to modify the navigational itinerary. 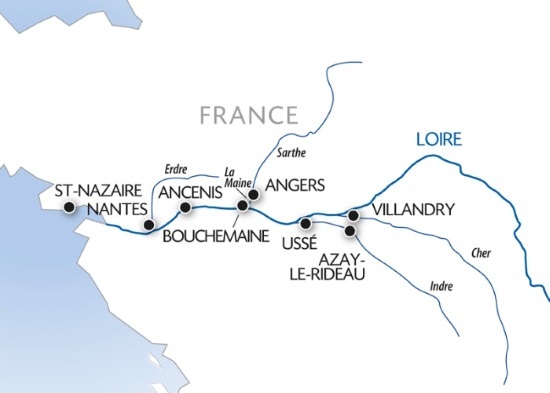 (1) Depending on docking availability, the stopover in Bouchemaine may be replaced by Chalonnes-sur-Loire. In this event, the order of the visits could be altered. (2) Subject to availability and favorable weather conditions.